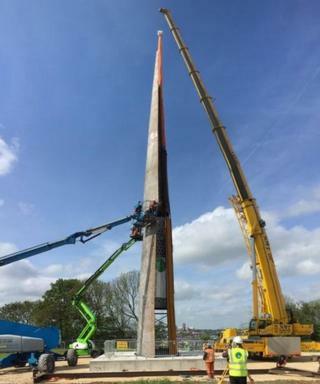 A 98ft (30m) high metal spire has been erected at the site of a memorial for World War Two aircrews. The structure is the first stage of a project to build a visitor centre and memorial in Canwick Hill, Lincoln, to commemorate the 55,500 servicemen who died serving Bomber Command. The 55 tonne spire, made of weathered steel, was installed on Sunday. Chair of trustees for the International Bomber Command centre said it was a "significant moment". Tony Worth said: "It is a major step forward because it is providing a visible sign that we are serious about this project. "We will actually get something that people can see and show this is really going to happen." The spire, which will stand higher than the Angel of North, has been made by a North Yorkshire company. The project will also see a peace garden and walls installed with the names of all the servicemen. Lincolnshire earned the title Bomber County because a third of all the UK's stations were based there.